A charming collection of delightful patchwork projects that are easy to make and perfect for giving as special gifts. Using five classic quilt patterns—simple squares, hexagons, log cabin, stars, and polygons—the projects range from pincushions, potholders and pillows to handbags, coin purses, and small quilts. Each project is accompanied by clear construction diagrams, with easy-to-follow step-by-step photos for how to cut, arrange, and sew up the project, making this the perfect book for beginner quilters or veterans looking for fun ways to use up their fabric stash. Also included are complete instructions for inserting zippers, plus many other techniques to help give all your gifts a professional-looking finishing touch. HISAKO ARAI and YOKO SANJO are editors at Boutique Sha, a leading craft publisher in Tokyo, Japan. 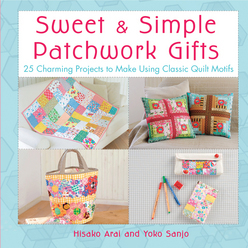 They have edited numerous craft titles, including many patchwork and quilting books.